Well these days if we're out to buy something in a local store, the thing that strikes right to your mind is, " Damn, I should've checked it's actual price ONLINE ". That's how everything has changed in 21st century, The word 'Online Shopping' is the next big trend & I couldn't agree more. Many leading Actors are even found doing commercials for these shopping websites for launching a specific product/deals. Now you might be familiar with some popular e-commerce websites like Amazon, Walmart, Flipkart, Snapdeal etc. that are quite possibly the most trustworthy website's that you may consider, while you're willing to buy something with your hard earned money. 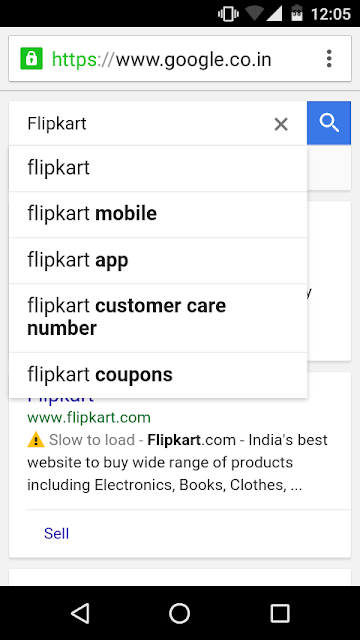 So now if we sort those names out countrywide, Flipkart has had a major success with Online shopping in India, all props to Sachin Bansal who has been a major inspiration for many startups, that are currently emerging in similar fields. Enough with that, my point is when we see the name Flipkart we buy stuff from here blindfolded, because of the trust these guys have built over the course of few years. 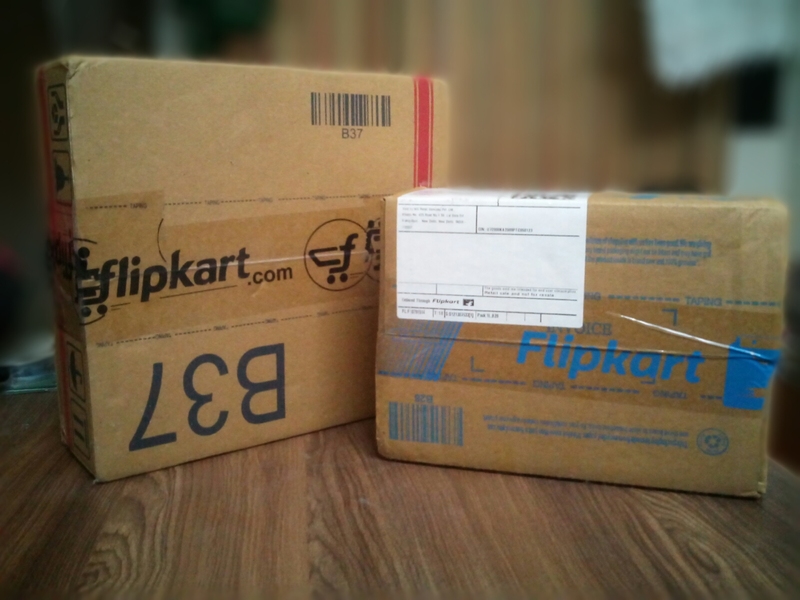 I've been a loyal customer of flipkart since a year now, all stuff has been great. But recently stuff hasn't been golden so far, today I won't review a device like I normally do. Today I'll let my readers know what I suffered this past month from flipkart & why Flipkart will never be my go-to-shopping portal again, anytime soon! So Let's begin. As I'v already said, that I've been ordering things from flipkart for a while now. On the way I received many things properly where the product packaging was fine, while delivery was in pristine condition. Though as far as I remember for about 2 times, I had received faulty products 1 of which was immediately resolved & a replacement device(Smartphone) was offered the very next day(2014). While second was a pair of T-shirt, that lost it's colour nearly after a month (PS : I always check those labels hanging inside before washing my stuff) & as the so called 'One Month Return policy' whoops up, I thought FINE.. let's give flipkart another chance. So after getting pass that, I made few orders again & everything was back to normal with all the cake & watermelon information. Not until, a day before yesterday or to be precise last month(Oct end). I happened to order a 'Ambrane Powerbank 13000mAh' exactly in last week of October, which was delivered by October end. But due to exams I never got to actually test it. Since it was lying for 3-4 weeks i thought well let's try it, so I started testing it(sometime around November, with the initial backup from packaging) & then a thing that striked my mind was that, it was giving me way low battery backup than the specs were intended to be! So This week I completely charged my 'Ambrane Powerbank 13000mah' for about 12-13hours & then I figured that it was charging my device (1700mAh) hardly 3 times, so if you can do the math it is provides 40% (5100mah of charge) of juice from the so called '13000mah battery', BS. So here I am, knocking a call-back request & the customer care executive calls back, here we go. Customer Care : Hi there sir, we just saw your complaint about the powerbank... ? Me : Yes, I bought this 13000mah Ambrane Powerbank, but it's not giving me the required battery backup. So i need a replacement product. CC : Sir we understand your concerns, but our return/replacement product policy lies under a month only..
Me : Come-on my exams were the reason I couldn't actually test this thing, I've paid 1000 bucks..are you kidding me? Besides only 10days extra have passed from your one month policy, while the device is in proper condition even with those scratch protective covers, I've hardly used it once. CC : Sir, I do understand your concern, but we can't do a replacement. You should consider going to a nearest customer care of the powerbank. Me : Are you kidding me? Simply 10 days.. Have passed... I can't believe this.. I ain't gonna buy anything from this site now-on. Post Script : Flipkart, guys if you're reading this, I'm not making it look fancy. What you just read, is completely the real deal. Let's just forget that one month stuff, alright? So I'm buying a electronic device. It's not a T-shirt or any handy bag which you can simply judge by fitting it on yourself and spending few hours in front of Mirror to find that one ugly spot, where you know that's not fitting properly & you return it back. Besides the Powerbank I ordered doesn't have a digital screen or anything that indicates it's battery in acutal numbers, there are unusual 4 dots(LED's) that glow & you've to guess left battery power upon that. So let me get this straight, when I received this order, all I did was crack open the box & tested whether everything was working fine, Well was I wrong about that? Is flipkart expecting me to test the complete backup the same day? I'm not road warrior nor do i live in a place where you can find lot's of electricity cut-off. The reason that i bought this was I had to attend few seminars which were day long & I needed to stay there for the rest of that day. I didn't knew that it would end up like this! Funny isn't it? (Fourth Result, search query to be precise). Ps : I'm not signed in with my G account. So after the conventional call approach occurred, I then reached out to them on twitter. Where I was assured that my issues will be sorted out quickly & they're sorry to hear this. They asked me to DM my registered mail id (Ahh..predefined message... ). Well, It's almost 3rd day now, has the issue been solved? Not even an inch. So i had no choice but to write about this. Surprisingly enough, they didn't care to send me a thought provoking predefined bot message on my registered mail id, letting me know for time being whether they've noted my concerns or not. You know, Sometimes we don't know few things unless & until we experience them personally, that's when we realize the real deal! Fun Fact(Readers) : Before judging Me, Why don't you guys head over to Flipkart Support account on twitter, you would be rather amazed to see how many people are not getting the exact stuff of what they're willing to pay for. Well, some of you now might be like, hey dude isn't it the manufacturer's fault? Well partially it is, but shouldn't the manufacturer provide proper aftersales services via the same ONLINE Portal depending upon the quality of the product? I'm not speaking about the 1 month policy, meh... My point is whenever that 'One Month policy' is crossed knowingly/unknowingly by any customer, shouldn't the seller provide proper aftersales support, instead of customers going out to find the service centre's & somehow luckily getting their devices fixed? Well for you newbies, Do you know flipkart charges margins from respective sellers (sometimes even 10%/product), whenever a Seller sells his product via Flipkart? Well that even goes to other e-commerce websites too. 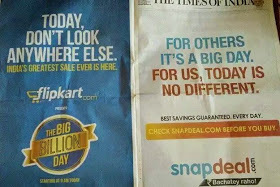 It's kinda like a newspaper's front page bid by publishers, compared to the main deals page(E-commerce sites) that stay on flipkart.. I don't want to talk about that now, because it's what every other seller out their does to outperform the competition. But then again ever wondered, how a specific mobile company has it's own page on flipkart? But, Flipkart : If you guys call yourself India's largest shopping portal, why do you deal with warranty issues OFFLINE ?! Simply drifting/redirecting it to the sellers.. Shouldn't that be considered as an ONLINE thing & your responsibility, too? Fact of the matter is this, If the product becomes 10 days old from the 1 month old policy, does it mean the fault in that product is the whole and sole mistake of the respective owner? Shouldn't flipkart provide an online option regarding after sales support from the sellers, itself? I mean not setting up everything on your own website, but to create an option for warranty services & redirecting to the company's website, ONLINE? Is that a hard job to do? Or put forth, only bogus/leftover products are provided during sales.. Shall we Indian's take that for granted? 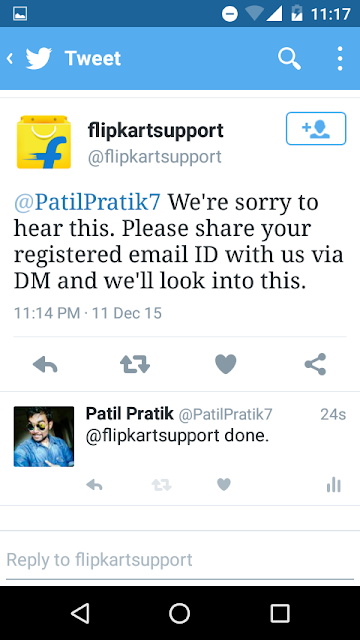 Let's see what happens with my defective product, what kind of responses I get in next week from flipkart. But one thing is sure that I'm never going to consider flipkart as my initial preference, while considering to buy something. This post doesn't mean that I'm encouraging someone to do the same, but I'm damn sure there are cent percent who will agree the content in this post. So far I'm keeping it cool, this post isn't a grudge but it certainly is the harsh reality, that many suffer on daily basis. Some may or may not be familiar to this, But if you're.. make sure you share your experience in the comments below & why don't you share this article with your friends/family. Further more I guess, help might be on it's way. Meanwhile for Online shopping, I'm heading to Amazon, Snapdeal & others. It's true that the quality of service went on a downward slide with Flipkart. 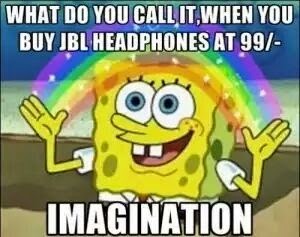 Yup, isn't it? Things haven't been good so far.